Winter Haven is a community located at the center of Florida's super region. This area from Tampa to Daytona (or the I-4 corridor as it is known) brags 9 million people. 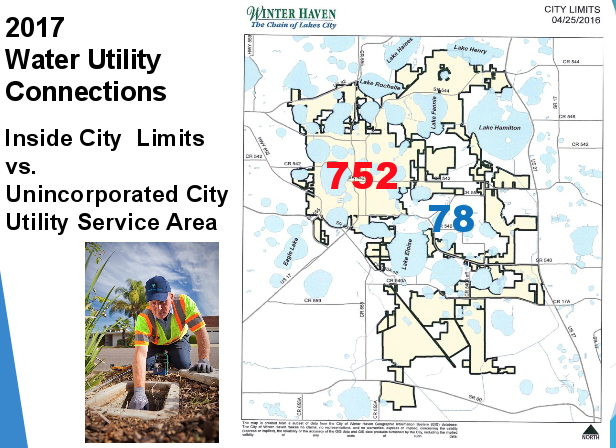 Roughly 80,000 of them are in the greater Winter Haven area as of 2017, with 41,134 within the limits of the City of Winter Haven. Winter Haven is considered at the heart of Florida's super region with a population of over 9 million people within a 100-mile radius. Winter Haven is located in Polk County, which is over 2,000 square miles and has a population of almost 667,000 (as of 2017). Winter Haven is located in east Polk, which is one of the fastest growing regions in the state. 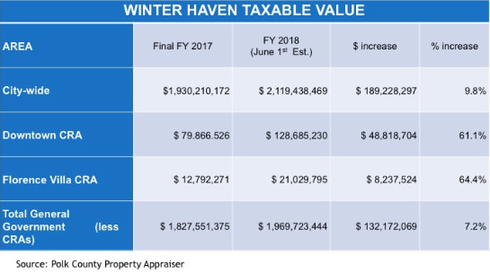 The Winter Haven Chamber is also a member of the Florida Chamber of Commerce which keeps comprehensive data on the state and counties within Polk. They maintain a website called The Florida Scorecard which keeps data from unemployment rates to graduation rates on a annual and monthly basis. In 2017, Florida Trend did a profile on Polk County. 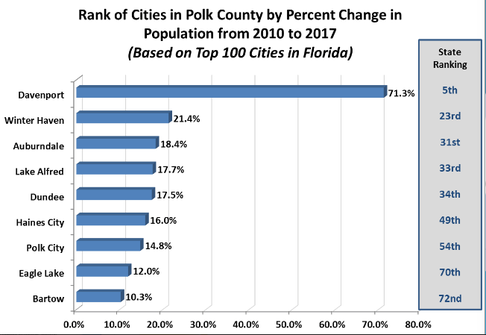 Polk County, located between Orlando and Tampa, has grown tremendously over the years with Lakeland and Winter Haven as its largest cities. Lakeland has recently been developing its area for the younger generations by creating new developments such as apartments, restaurants and bars. Like wise, Winter Haven has been reimagining their downtown footprint as well as their overall presence in Polk County. Winter Haven opened its first brewery just last year called, Grove Roots. This home grown brewery connects residents to Winter Haven's rich history with citrus. Also, Winter Haven is the home of LEGOLAND Florida Resort, previously known as Cypress Gardens. This theme park has generated a large rise in tourism and continues to expand, as it has just added a new accommodation called LEGOLAND Beach Retreat. Winter Haven has become a sought after community that offers residents with a relaxed, hospitable, lakeside lifestyle with canal connectivity to 24 of the 554 lakes in the area. With a population of over 600,000, Polk County continues to grow more and more each day. 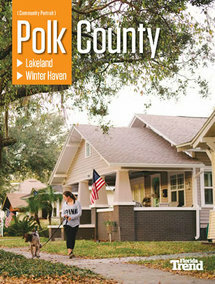 ​To read more on Florida Trend's profile on Polk County, click the photo above or click here. ​At our annual Economic Summit, the City of Winter Haven's Growth Management Director Merle Bishop presented the story of Winter Haven's growth over the last several years. Perhaps one of the most astounding statistics is the 21% growth in Winter Haven's population between 2010 and 2017 according to UF's annual BEBR study. 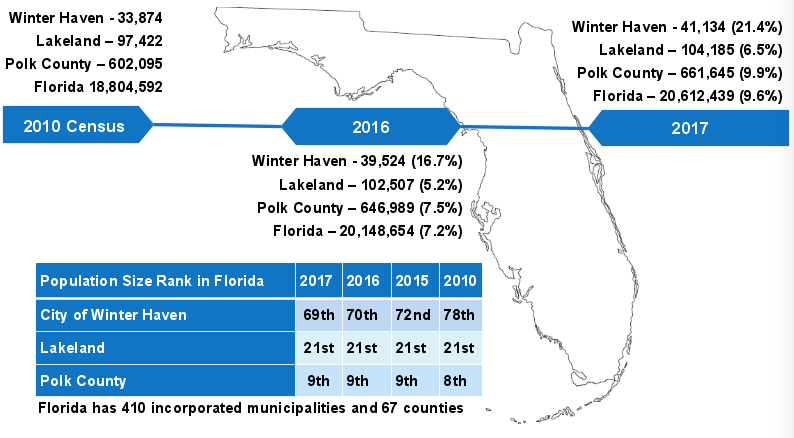 ​This image shows that Winter Haven is directly in the center of Florida’s super region and experiencing some of the highest levels of growth in the state. ​All Polk communities in the top 100 of growth in Florida are in East Polk County. 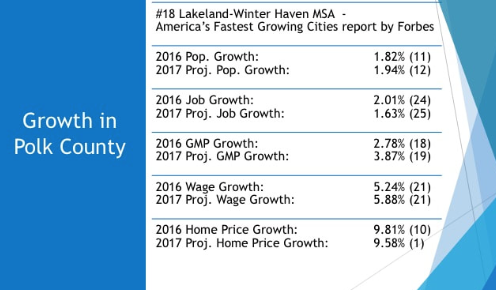 ​Forbes has identified our metropolitan area (Lakeland-Winter Haven MSA) as the 11th highest in the country in population growth, 24th in job growth, etc. 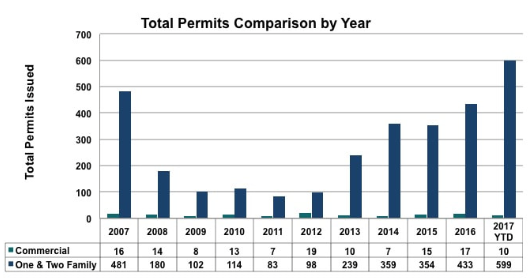 This graph shows the increase in construction permitting over the last 10 years through year-to-date 2017. We’ve now exceeded 2007 levels in the first 3 quarters of 2017 in Winter Haven. ​This graph shows that the majority of the utility connection requests were in the City limits, not to the unincorporated area. 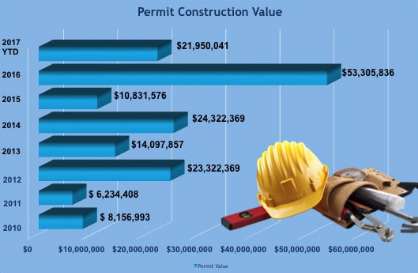 2016 had permitting values exceeding $50M which did include the hospital ER expansion and the Courtyard. ​This graph shows the increase to property values across the City. We have two CRA districts, both downtown and the Northeast Winter Haven area known as Florence Villa. 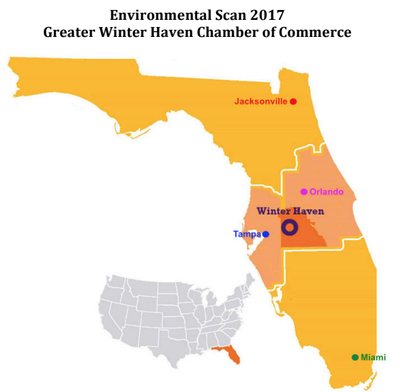 If you want to learn more about Polk County and Winter Haven, check out this Environmental Scan done by the Winter Haven Chamber. This scan covers the economy, demographics, population projections, education, competition infrastructure and more. Click here to read more!